Historically, Leeds is a city that has been chained to industry. Throughout the centuries, Leeds has been at the forefront of production in the UK, establishing firm roots in various arms of the manufacturing sector as demand for consumer goods has changed and diversified. In recent decades, however, Leeds has been subject to something of an image overhaul, led by its desire to evolve into a 21st century capital of the north. Here, we discuss the steps Leeds is taking steps to position itself as an affluent hub for industry and attract direct investment, from both at home and overseas. There’s no denying that the economy in Leeds has changed substantially since the post-industrial era. Much like the rest of the UK, services now dominate the fiscal landscape in place of primary industries. In 2011, the financial and services sector in Leeds was worth a staggering £2.1billion, making it the fifth largest in the UK behind powerhouses London, Edinburgh, Manchester and Birmingham. The authorities’ dedication to marketing Leeds as a nation-leading centre for business has attracted talent and investment to the area, resulting in a great deal of new development that has been introduced to facilitate the new-found demand for housing and commercial space. Leeds has also gone through something of a rebrand, updating its image by breathing fresh life into some of its most iconic institutions. Leeds Metropolitan University, which is home to over 25,000 students, has recently rebranded to Leeds Beckett in order to shed its polytechnic connotations; Leeds Shopping Plaza has since been incorporated into the brand new large-scale retail and leisure development Trinity Leeds, which was officially opened in March 2013 and is now regarded as one of the most successful shopping centres in the UK. Initiatives such as these are largely designed to send a strong core message to the rest of the nation, and indeed to the rest of the world: while Leeds is keen to remember its heritage, the city is committed to continually developing its offering and its infrastructure in order to meet the changing needs and demands of a modern-day population. 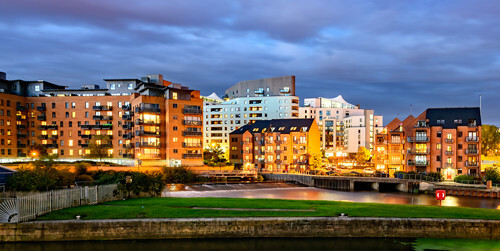 Investors in residential property have typically overlooked Leeds in favour of many of the country’s world-recognised cities, but many are now waking up to the potential offered by this flourishing region. The population of the city centre doubled between 2001 and 2011, demonstrating a clear trajectory for growth that shows no sign of slowing post-recession. This substantial population increase is likely to be closely related to the fact that Leeds also boasts the second largest city economy in the UK and has consistently experienced higher business rate growth than the UK average. Clearly, then, the growth potential for both domestic and international buy-to-let investors is huge. Contact Surrenden Invest today to learn more about the opportunities available for investors in Leeds.